DETROIT, Mi. 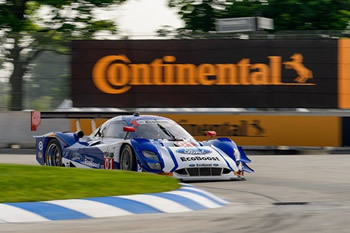 (May 31, 2015) – Chip Ganassi Racing with Felix Sabates (CGRFS) with drivers Scott Pruett and Joey Hand finished fourth in the Prototype class in the Chevrolet Sports Car Classis Presented by Metro Detroit Chevy Dealers in Detroit, Michigan. Pruett started the No. 01 Ford EcoBoost Riley in the fourth position for the opening stint of the 100-minute sprint race. As the seven-car Prototype class navigated through the 2.35-mile street course, Pruett kept the No. 01 Prototype clean as the bumps in the new pavement proved to be a challenge. The first caution of the race fell with an hour remaining and allowed Pruett to make the team’s only pit stop and give the wheel over to Joey Hand. Hand restarted the race in the fifth position as the rain began to fall. With 10 laps to go, a third full-course caution came out allowing Hand to make the pass for fourth on the final restart. On the final lap, the No. 5 had a mishap causing the Corvette DP to spin allowing Hand to close the gap. A late-race battle between third, fourth and fifth led to an exciting finish, but Hand wasn’t able to make the pass for third resulting in a fourth-place Prototype class finish. The next TUDOR United SportsCar Championship race will be the Sahlen’s Six Hours of the Glen in Watkins Glen, NY at Watkins Glen International on June 28.